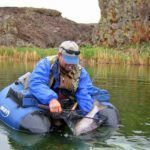 If you are keen on making a lunch of your catch or simply clean whatever you have caught, a fillet knife is amongst the most important element that you must carry with you. While it is true that you can cut a fish into tiny pieces, a fillet knife enables a clean cut and precision piecing. 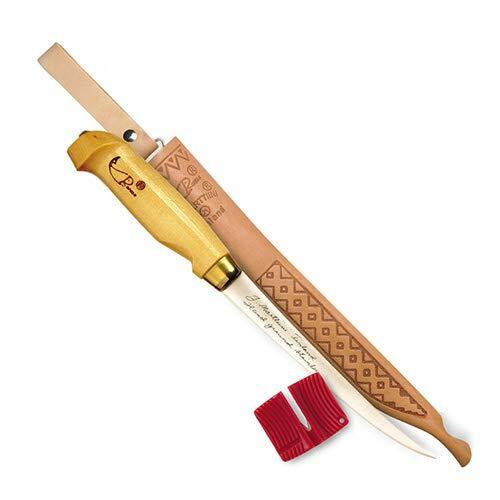 The best fish fillet knife is the one that is thin, compact and extremely versatile. These knives specialize in providing great cuts, clean finish and an absolutely startling clarity. They are very effective in deboning a fish and cutting them into slender pieces. This knife is built in a way that it makes cutting a fish really simple. 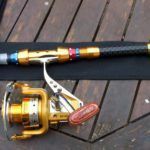 But for a gear that is so effective, it has several key characteristics that you must pay attention to. Only then, you will be able to make a proper choice. The wrong knife can not only lead to a painful filleting process but also result in significant wastage of precious meat. Also, it can even increase the risk of injuries while deboning the fish. That is why choosing the best fish fillet knife can be challenging. They are the ones that can help you cut the fish clean, but at the same time, cater to your comfort. That is exactly why it is very important to pay attention to details. After all, it is these details that go on to decide the ultimate quality and the extent of satisfaction that you can get from a fillet knife. We decided to make the choice a lot simpler for you by reviewing the top options in this category and creating a ready list of alternatives that you can buy. Ultimately the challenge is to balance precision with comfort and convenience. 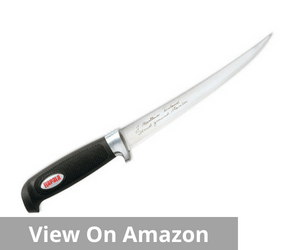 Here is a handy list of the best fish fillet knife that all fit beautifully in your budget. 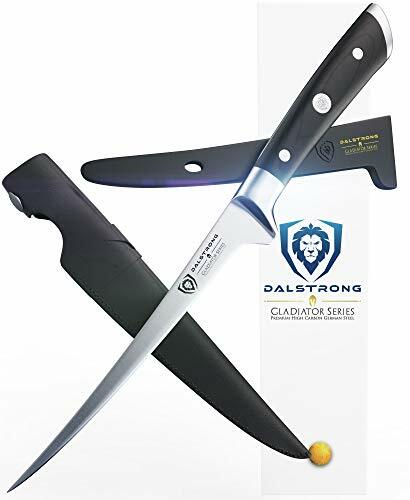 If you want to achieve absolute mastery with a fillet knife, the Dalstrong Gladiator Series is one of the best fish fillet knives to rely on. It represents both precision and fine designing excellence. 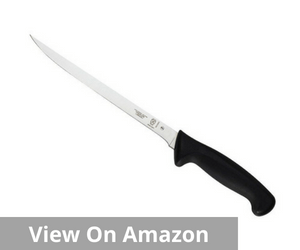 These knives are designed in a way that it is appropriate for de-boning, de-scaling, filleting. 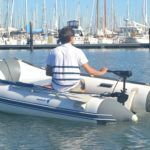 It can also be used effectively for trimming, skinning and butterflying the fish a lot easier. This knife is about 1.5mm in thickness and is extremely flexible. As a result, this knife also facilitates easy maneuverability as well. It is precision forged, ultra sharp and is resistant to wear and tear. This is a single-piece, high carbon steel. The steel used is also a relatively high grade one, the ThyssenKrupp German steel at 55 Rockwell. What’s even better is every care to avoid damage to the blade is taken. As a result, you have a separate cover for storing in drawers and outdoor travel. The edge of this knife deserves special mention. It is sharpened to 16-18° on either side. This helps in maintaining a perfect balance between the blade’s resilience and overall sharpness. Moreover, the blade height enables comfortable knuckle clearance and possibly more room to work with. In terms of looks too, this knife is a clear winner. The hand polished blade with satin finish, the tapered design that reinforces hardness and flexibility and precision tempering add to the durability of this knife. The overall combination of features makes this knife extremely robust and stylish to look at apart from being very functional. The handle of this knife is carved from laminated pakkawood. These handles are specially imported from Spain. They are not just extremely strong and effective, but versatile too. Whether you are in a camp or a kitchen, these hold you in good stead either way. There are very few 1-star ratings for this product. Most users seem to be quite satisfied with their product but a few of them are not so satisfied with the flexibility potential of the knife. 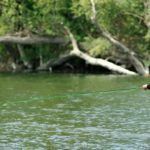 But that may also be hampered by the overall lack of understanding of the technique or the type of fish that they are filleting. 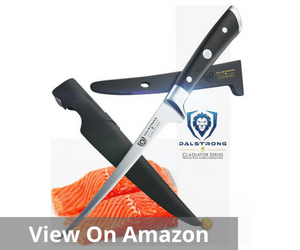 If you are keen on using an easy to operate, flexible and precision knife, this is one of the best fish fillet knives on the market now. Affordable, easy to use and perfectly adaptive, this knife represents a unique combination of value and precision. 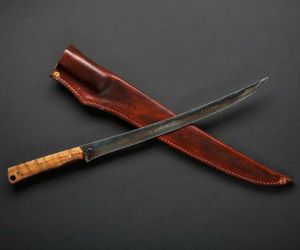 The blade of this knife is about 7 inches and is extremely versatile. A pure Swedish stainless steel blade, it is both durable and effective. The sharpness of the blade is well balanced with the flexibility, and together it makes the knife extremely responsive. It also enhances the efficiency and usability of the knife both in your kitchen and outside with relative ease. The handle of this knife deserves special mention. It is made of varnished Birchwood and is specially hand tooled. The designing of the handle confirms to the ergonomic basics. The Laplander leather belt sheath and the single-stage pocket sharpener are additional benefits of this knife. No doubt, it is often the most preferred knife by most both in terms of convenience and cut. The average strength of the knife coupled with its sleek design makes it an indispensable part of the gear set that you set apart for your adventure trips. This is one of those few products which does not have a single 1-star. But there are a few 2-star ratings that indicate that the sharpness dulls very quickly in case of a few users. If you are keen about a functional, no-frills and easy maintenance option, the Mercer Culinary Millennia is one of the best fish filet knives to opt for. It represents great quality and superior ability to deliver clean and precise cuts. In fact, this is one of those knives that are high on delivery and without being extraordinarily expensive. Made of the highest grade Japanese steel, this blade is very effective, sharp and one of a kind combination that represents both efficiency and affordability. The high carbon stain-free blade also needs very light care and maintenance. 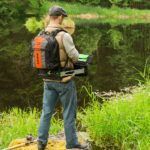 As a result, it is rather easy to use and makes for an indispensable companion on all your external trips. This allows razor sharp edges with minimal effort. It also resists rust, corrosion, and discoloration apart from the anti-staining features. The knife is also unique in the way; it caters to user safety. 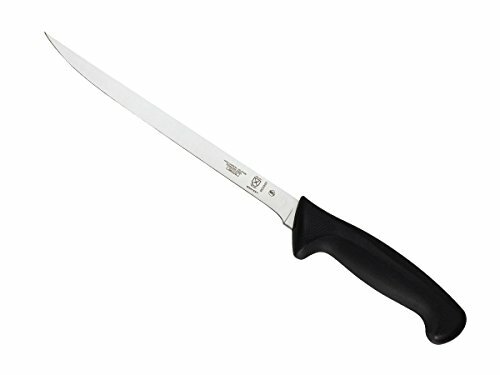 The handle of this knife is ergonomically built and the material used is a combination of Santoprene and polypropylene. This ensures both comfort and durability. The handle also has a firm slip-resistant grip. This comes equipped with finger guards too. This knife is also NSF certified. NSF is one of the leading provider of public health and safety-based risk management solutions globally. This is an independent organization and offers certification only after rigorous testing, performance and quality check. Though just 1% of users are unsatisfied, the company may well pay heed to the fact that they have raised questions about the efficiency of the blade and sharpness. However, it is possible that this may also be due to the degree of use. If you are keen on a power packed performance in your kitchen after a successful angling trip, this is the best fillet knife to work with. The Rapala Heavy Duty electric knife is known for its high-performance ability and razor sharp edge. 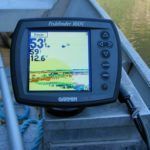 In fact, it is one of the best bets for fatigue-free filleting with precision and eye for details. It is one of the most innovative and top grade offerings from the company that offers complete satisfaction and 100% user convenience. This heavy-duty knife has a 7.5-inch reciprocating dishwasher safe blade boats of 2 times the blade speed of normal electric knives and almost three times the power of standard fillet knives. The best part is that so much power comes with absolute safety and comfort. The knife has a rather comfortable and relaxed grip and cuts down your filleting fatigue to a large extent. It offers a comfortable fit on most hand types and easily glides through the meats without any jagged marks. 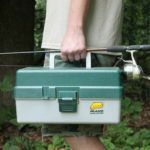 However, these knives don’t come with their own packing so storing them in a tackle box without compartment can be difficult. But you can easily solve the problem by using a simple blade cover or a box for storing the knife in a safe and proper manner. 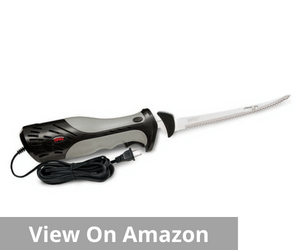 Cuts down relative filleting fatigue and ensures a neat cut. Consistency has been a problem in select cases where the knife has stopped performing after a few months. But this does not seem to be a regular problem, and there are just a few one of cases of the same. 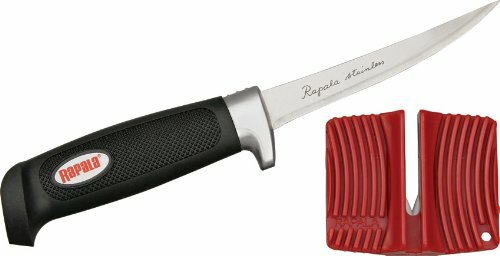 When you are drawing up a list of the best fish fillet knife, it is hard to not mention the Rapala4 Soft Grip Fillet knife. This one comes equipped with a superior soft grip that truly enhances the overall filleting experiences. This knife is also known for the superior blade strength and single-stage sharpener. This knife comes with a flexible stainless steel blade. It is not just anti-stain but also resists corrosion and rust to a large extent. Definitive quality coupled with proven excellence is the most unique selling point of this knife. Whether in terms of flexibility or sharpness, this knife represents a wide range of advantage and convenience. The most interesting factor is this is a knife with a wide range of pricing alternative too. So, you have some for as little as $11 and some of the high-end options may cost up to $70. The knife also comes equipped with a soft grip handle. The soft grip is also slip resistant and adapts to your hand shape. This cuts down the fatigue of filleting to a large extent and guarantees great user satisfaction. This knife also comes with a black sheath that easily fits in the belt and has a single-stage sharpener. This makes sure even if the sharpness dulls a bit, you can easily restore it to its peak level with just a little bit of effort. 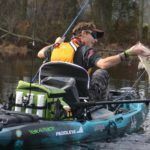 The bolster around the blade is not sealed and can be hazardous for extended use or difficult filleting. Buying the best fish fillet knife involves a fine study of a wide array of factors. You cannot look at any single factor and determine brilliance. The trick is to look for a balanced product that also fits into your budget. Moreover, the knife should also have sufficient strength to cut through the fish that you may have caught. All in all, you have to look for a good combination of quality and pricing as well as overall usability. That will offer you an undeniably brilliant combination and effective option too. The precision with which you use your fillet knife is directly proportional to the overall flexibility. Therefore, this is a key parameter when you are deciding on the best fish fillet knife. Filleting is rather intricate work, the flexibility of the blade is what makes the whole process rather convenient and precise. Normally smaller knives have greater flex compared to the larger ones. You will have to choose the degree of flex based on what you need to use the knife for eventually. 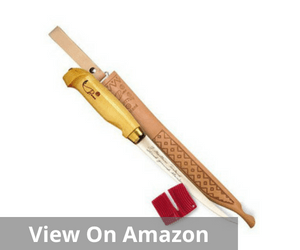 The quality of the blade is critical when you are looking for the best fish fillet knife. 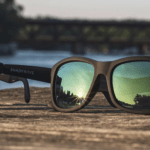 Normally high grade and carbon and stainless steel variants represent strength, durability, and flexibility. The blade strength is often directly proportional to the blade quality. 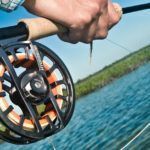 A low-grade blade also runs the risk of breaking in case you are using huge force or cutting a large fish. The size of the blade is an important concern too. In fact, fillet knives are available in a wide range of sizes depending on the kind of fish that you are going to fillet. Narrow, small sized blades will give you precision cut and are generally more flexible. But if your game is a large one, these won’t be able to do justice. 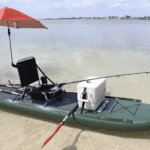 You will need a relatively heavy duty one for large sized fish. So you can understand that there is no set formula or combination. It totally depends on the size of the fish and also the purpose you need it for. For example, skinning and deboning will need fillet knives of different precision and combination. The grip of the fillet knife is very important. If you are not able to hold the knife properly, you can never exercise full strength. Therefore when you are looking for the best fish fillet knife, make sure that you opt for the ones that have a comfortable grip, ergonomically-made handle and helps you exercise full strength when you are deboning or skinning the fish. That is what will guarantee complete user satisfaction. So when you are looking for the best fish fillet knife, it is vital to pay attention to the details. If you want to optimize the value of every penny you spend, it has to be a perfect balance of strength, flexibility, and innovation. 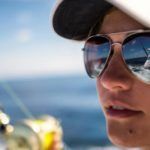 That alone will be able to offer to you a game changer that will help you be a master of filleting every time you try doing it. You can also refer to our list of options for narrowing down your alternatives.